As it hath beene often acted at the Swan on the Banke-side, by the Lady ELIZABETH her Seruants. LONDON, Printed for Francis Constable dwelling at the signe of the Crane in Pauls Church-yard. 1630. 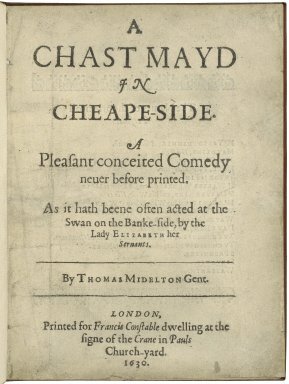 Title page imaged from Folger call number: STC 14780. Image is not from the transcribed copy.